Bash’n’Dash 2015 – Leroy and Keith take it to a play-off. The cup & Dash (sic) is done and dusted for another year. What a day, spectacular Royal Longford turned it on for the visiting southern crew. One slightly wonders why the Masters (that other tournament) is played at Augusta (one for debate for those playing on that rebel tour). Making the journey to the far north: Basil (world no 1), Cravo (the back to back champion looking for his third), Leroy (the destroyer Stevens), Ian, Felix, Garry, Alex, Matt, Bill and myself (really gotta say playing with a generous handicap). After a slightly shaky start with start times a little confused. The game was under way, groups of Cravo-Ian-Alex, Garry-Matt-Felix, and Bas-Leroy-Keith. The latter group had the advantage of getting onto the course early and for at least one of this group having knowledge of the course layout. I cannot provide comment of the other groups (please feel free to advise); scores were down on other years. Perhaps the weather was too good for the defending champ, who plays his best when conditions at there worst. The grouping of Bas-Leroy-Keith provided some great golf. Leroy (2 birdies, 3 pars) playing hot all day, with chips off the green into the hole (1st? 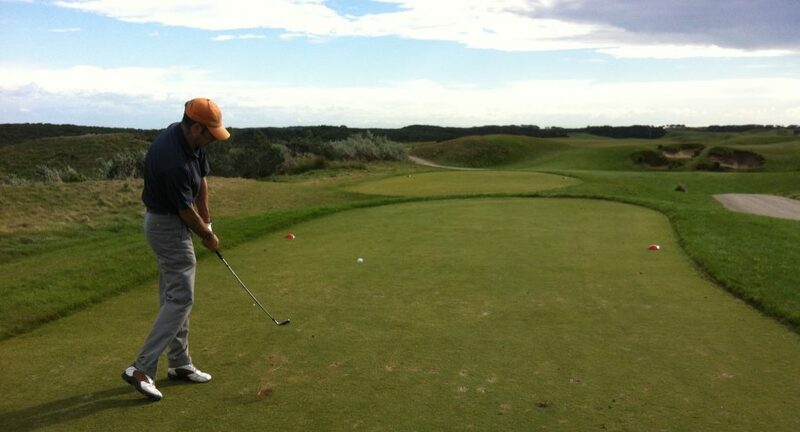 ), great drives and ‘Shot of the Day’ on the 10th of 190m landing within 1-2 m of the pin (highlight reel stuff). Bas played great all day (9 pars), consistently smoking drives down the middle, and teeing off and landing to within 3 m of the pin on the 9th (closest to pin). For me, I played consistent of a sort, nothing exciting but just ok. I thought I was in for another long and ugly day after losing three balls in the pond in practice. Yet there was some refreshingly better iron work with at least two good shots a holes, my best was a tee off on the 13th onto the edge of the green; yet as always managed to find a way to bogey. After 18 holes – Leroy the destroyer and I were locked at 34 stable ford points after 18, with Bas 2 pts back on 32. The resulting playoff between Leroy and me could be considered a chook raffle. We both shanked our tee off. It came down to a horrible kick through the green for Leroy’s 2nd and an over powered 3rd. With a lucky break and pressure putt for my 3rd and 4th shots to seal the W and cup for 2015. Well gentleman that is a quick wrap from me. I do need to thank the tournament organisers, the rules committee, the sponsors, the competitors who travelled from the south, and Bill for providing a good tip of dropping the pause on the back swing and to not over think the process. Thanks again for making the trip to hallowed turf of Royal Longford. Note: please add any further thoughts or reflections and pass onto Matt, cheers. As for next year….happy to consider all options. Misunderstandings and controversy abounded at the start, and there was some angst amongst the Felix-Ian-Cravo group. All of them struggled to turn that into winning form, and a fantastic down-to-the-wire victory by Keith ensued. Note that Leroy certainly did not shank his tee shot into the par 3, it just drew a touch too much and hit the bank and bounced right. His flop shot was perfect too, but caught the downslope and scooted across the green. No luck for Leroy on the playoff hole. Keith nailed a pressure putt to shut the door and claim the Auld Mug. Posted on August 23, 2016 April 27, 2017 by Gentlepersons' World Golf Tour, Tasmania	This entry was posted in golf and tagged golf, longford, tasmania. Bookmark the permalink. ← 2014 Wanderer – Leroy Magic pips Felix on the 72nd hole!